A Plainfield woman was found guilty this morning for the 2010 stabbing death of a 36-year-old man, said Union County Prosecutor Theodore J. Romankow. Just after 2 a.m. on March 28, 2010 police were called to the corner of Central Avenue and W. 7th Street in Plainfield. They discovered Bruce Rivera, of Plainfield and another man suffering from stab wounds. Rivera was pronounced dead at 2:27 a.m. while en route to a local hospital, said Assistant Prosecutor Julie A. Peterman, who prosecuted the case. 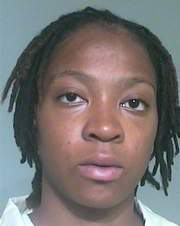 Markita Norris (DOB: 4/1/1988) was arrested a short time later by the Plainfield Police Division and was later charged by the prosecutor’s office with 1st Degree Murder, weapons possession and drug distribution charges, said Peterman. The other victim, now 36, was released from the hospital a few days after the attack, said Peterman. Malcolm Hunter, of Plainfield, was also arrested with Norris. He was charged with weapons possession and eluding police. He pled guilty to both charges earlier this year and is awaiting sentencing. Union County Homicide Task Force Detective Kevin Grimmer served as case detective. Norris was found guilty following a month long trial and less than four hours of jury deliberation. She faces life in prison when she is sentenced on August 3, 2012 before Judge Robert J. Mega.